You're walking around King Street wondering, "Hmmm, what should I have for dinner on a Friday night?" and come across Cicciolina. Once you walk in, see the ambient atmosphere and are politely seated at a table - you inspect the menu. Something catches your eye, especially if you see things you're not quite accustomed to at an Italian restaurant, such as gnocchi with white sauce instead of the traditional tomato-based sauces. You're flabbergasted by the sheer variety available on the menu. It's not simply pizza, pasta and a questionable chef's menu as can be in many places; there are even vegetarian options available for those who wish. I went to Cicciolina numerous times prior to writing this review, as I didn't think one time would do it enough justice. At least, that's what my thought process was in Cicciolina, all while relaxing in the warmth of indoors. From seafood such as chargrilled calamari, to beef salad and bruschetta - the entrée menu was very impressive. I went ahead and ordered the bruschetta, as I have a soft spot for that particular dish. The tomatoes were chunky and fresh, tasting like they had just come out of an organic garden. The balance of herbs, garlic and olive oil was flawless – it wasn't too oily or too dry, as with some bruschetta. In my experiences so far, Cicciolina mains have been very impressive. Cooked well, they were mouth-watering and the flavours infused well together. Nothing was too salty or flavourless; I think balance is a key adjective for Cicciolina. 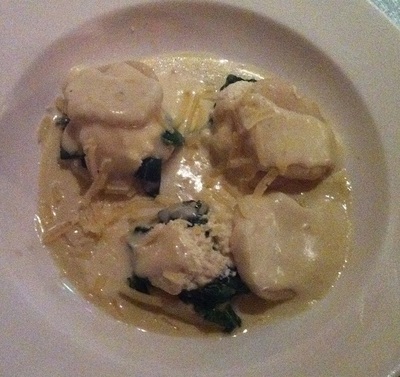 Depicted below is a dish off the chef's menu, a gnocchi with white sauce and spinach. The sauce is béchamel and the pasta was infused with ricotta and cheese. The texture of the gnocchi was particularly impressive and I loved how chunky the actual gnocchi pieces were. The Chicken Involtine is not just your ordinary chicken, either. Infused with ham, cheese, spinach, potato and a creamy seeded mustard sauce, it was absolutely delightful. It was hot, tender and the sauce was just delectable. Seafood lovers who also love pasta will adore the Linguini with Prawns. The lovely texture and the sheer size of the prawns, combined with the tomato-based sauce makes for a hearty seafood dinner dish. Unlike the aforementioned gnocchi in a white sauce, the gnocchi depicted below is on the regular menu. The gnocchi in a four cheese sauce is a scrumptious dish, with extremely tender gnocchi and oh my – the cheeses really hit the spot. Different to the gnocchi with spinach in béchamel sauce, this dish had a distinct flare. Once again, the portion size was perfect too. I expected it to be too rich, but it just hit the spot. The portion sizes at Cicciolina have so far been consistently enough to fill me up, but not too much as to leave some room for dessert. I was lucky enough to sample three desserts in my visits to Cicciolina. The Cream Brulee had a large strawberry sitting in it, with an adorable leaf for garnish. After I broke through the crunch layer on top, I tasted a delightful cream. I also loved the decoration of this dish; it was aesthetically pleasing. Maybe this had something to do with the castor sugar offsetting the colours a bit. The tiramisu also featured a strawberry with the adorable leaf and castor sugar. The texture of this tiramisu was great – it was neither soggy, nor dry. 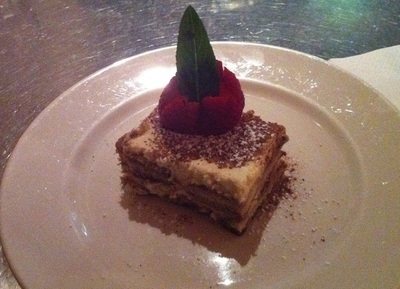 The flavours were very pleasant and I was impressed, it reminded me of homemade tiramisu. 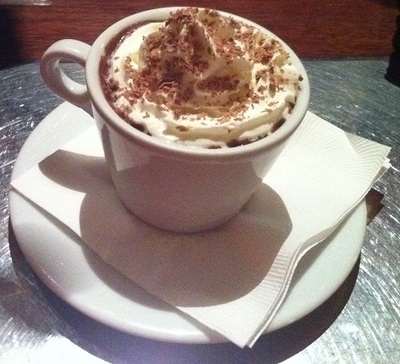 Last but not least, the Italian hot chocolate came with whipped cream and chocolate flakes. There are actually two versions of this dessert, one with baileys and a non-alcoholic one. Depicted below is the non-alcoholic version. I can only describe it as the heart attack of hot chocolates. 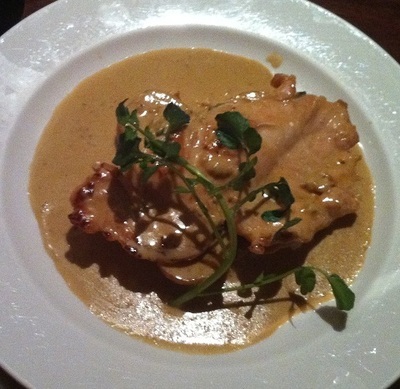 Overall, Cicciolina provided me with pleasant memories of food, atmosphere and service. I highly recommend trying this establishment because you will be treated warmly and the food is worth giving a go. I love Italian food and the menu features pizza, risotto, pasta and much more. There are many vegetarian options but if you're a seafood lover, you don't have to fret – you've also been considered. Carnivores can also order steak, if they so please. Sweet-tooths everywhere will love the desserts and bruschetta fiends like myself are to be impressed.